Home News Who should you appoint as executor of your Will? 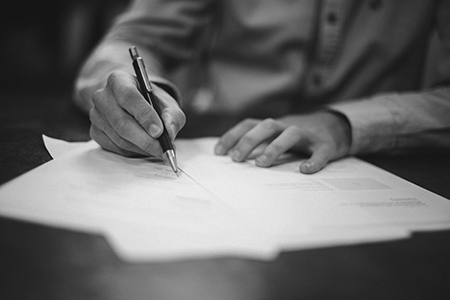 The executors of a Will are the representatives who have been chosen to ‘administer’ the estate and, ultimately, ensure the exact wishes of the deceased are carried out. It is important to choose wisely; the right executor will ensure your Will is administered smoothly and conflict is avoided. We recommend you name a minimum of two executors and a maximum of four. Any Trust formed as part of a Will must have two executors. Availability – Are they likely to be available to carry out the required duties? The Probate Office estimates that the process of administering an estate can take an average 80 hours of a person’s time. Suitability – Are you confident that they have the right disposition and ability to carry our the duties in an honest and responsible way? Willingness – Have you asked them if they are happy to be given the role? Age – Is there a strong possibility they could die before you? Who would make a good executor? The ideal person for the role would be someone you consider to be honest and to have good morals. Perhaps most importantly, you must be able to trust that they will adhere to your wishes after you have gone. If you prefer, you can appoint independent executors; this may be advisable if your wishes are contentious or could lead to a personal dispute. Administer the payment of any legacies detailed in the Will and distribute the remainder of the estate to the correct beneficiaries. must not put themselves in a position where there is a conflict between duty and interest. It is important to ensure your chosen executor understands the importance of carrying out their duties fully and responsibly. An executor could be held personally financially liable for any loss resulting from a breach of their duty – even if a mistake is unintentional. Where there are ongoing Trusts created by the Will, for example where children under 18 have inherited money, the responsibilities of executors will also be ongoing. The trustees are commonly the same people as the appointed executors in the Will. If you are appointed as an executor but decide you do not wish to do it, it is possible to ‘renounce’ the role, provided that the process of administering the estate has not already started. Appointing your executors and/or trustees is a key part of our Will preparation service. We can provide further advice to help you choose the right person. To make an appointment to make a new Will or review an existing Will, please contact our Barrister Intermediary Sharon Rigden on 01772 431233 or srigden@rfm-more.co.uk.